Good Monday Morning! How are things with you? I'm back in business with coffee and coughing, but I feel so darn good compared to last week I'm calling this cold over! Take that germs! Anyway, lucky for me and you because today is my day on the Little Quilts blog tour. 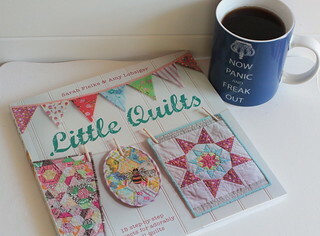 Just to bring you up to speed, my pals Amy and Sarah wrote this super cute book, Little Quilts! I love that it celebrates their friendship quilt style, since so many of us are friends through quilting. You can read on Sarah 's and Amy 's blog about the book and how they came around to writing it. So onto the super fun super scary to me part! They've devised a secret swap between some friends and over the course of the next month or so, we'll be making a little quilt to send to our swap partner. Of course I know who my TOP SECRET SUPER SWELL swap partner is, but choosing something to make for them? Yikes! Do I choose something that says 'swap partner' do I choose something that says 'me' to my partner, and don't even get me started on what quilt to make. I've had my eye on that basket quilt since I first saw it on Amy's blog. And that bee... Could I even embroider well enough for that? I love it so much. You'll see, the people on the list are some pretty amazing quilters, so there's pressure all over the place! Well honestly, not really, won't a swap partner love anything? I THINK SO. Anyway wanna see the list? Duh, of course you do! To spice things up a bit more, Cico books is giving away a copy of Little Quilts at each stop along the way, so leave me a comment giving me some advice on the swap, and I'll announce the winner next Monday. Don't worry, even if you don't win, you'll have some more chances coming up to try again along this blog hop! Thanks Amy and Sarah for including me in on this fun secret swap, and thanks to Cico books for sending me a copy of it to use! Oh! Please enter me! I love little quilts! I think that either choice of quilt style..yours or hers...would be perfect! Cute, cute book! I think you should make something that is 'you'! What a fun book! Your swap partner will love whatever you make, of course. I think a quilt that says you. Your style is so unique and she'll love it. I'd love to win the book! That looks like such a fun little book. And honestly Pam, it won't matter what pattern you pick -- with your fun, fresh style, it will be perfect! I just love little quilts. This book looks perfect for cute fun projects. such a hard question for me, if my swap partner makes an inspiration collage, then I usually to make something inspired by the collage. Go with your style, your partner can always make one in her style. I would love to make some little quilts for my daughter. You should definitely make something with your fabrics and in your style. That way your swap partner will think of you every time she looks at your little quilt. 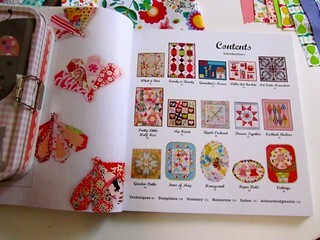 Thanks for the chance to win a copy of the Little Quilts book! can't wait to see the new book. love anything that Sarah does. thanks for the chance of winning the book. I would love to win this book, the quilts are adorable. The amazing patterns stand out to make the quilt. This book looks adorable! Hm I'd say go with a quilt that you like but won't be sad to give away? =D altho I suppose you can make another one since these are small and prol fast. I just find I end up using my last fabrics on gifts and then am all sad when it comes out super cute and I give it away. =D of course then it's also awesome to see your friend using it too! Pam - which block would 'you' like to receive? Make that one. Sorry - you can only choose one :)! Can't wait to see which one you make. Thanks for this giveaway chance. This looks a great book!! I think you should make something that you like!! looks like a great book! I love little quilts because I actually finish them! I think the bee would be loved by everyone - and you could applique it with some stitchery added - the pattern is right there...which would a Pam touch to it! The honeycomb could be in either bee fabric or a color the recipient loves. Can't wait to see what you come up with. what a great give away! I would do a quilt that SCREAMS you...because everything you make is ADORABLE!!!!!!!!!!!!!! Decisions are the hardest part for me in quilting. I just want to get to the machine and sew. I'm sure whatever you make will be lovely and greatly appreciated. I guess you could close your eyes and pick the quilt design as though it were a challenge quilt. The bee quilt is a lovely design. I think you should make the pattern that speaks to you, and choose fabrics with your swap partner in mind. Sew and enjoy. I usually look at my swap partner's blog and have a look at the type of things she likes. I then try to make something I know she would love. Either way, I'm sure she'll love whatever you make. Thanks for the lovely giveaway. I have 12 ladies that sew with me twice a month. Won't we have fun ! Swaps are fun but really stressful for me too. I ended up remembering that I would love ANYTHING someone took the time to make for me and to just go for it. I'm sure that whatever you decide will be lovely. I like to go for the persons favourite colors, but in my style. I would never give anyone as creative as you advice. Anyone would be thrilled to have you as their swap partner. I would try to combine both your own "likes" with those of your partner. I'm sure that whatever you make will be amazing. Love this book! Number the quilts in the book. Cut squares that equal that number. Number the squares. Fold them up and put the folded squares in a coffee cup. Pick one out of the cup and make that in your absolutely adorable Pam Kitty fabrics. Your swap pal will love it. I would go with something you think she would like. But, I'm sure she will love whatever you make for her. I am sure any swap partner is going to love what you make! Do you and they will love it. thank yoU! You can choose anything and I am sure it will be great for your swap partner....love everything you make. Thanks for a chance to win this fun book. That is one cute book! Of course your swappy partner will love what you make! Make what makes you happy! Here's my advice....all you need to do, is make a cute vintage mini out of your gorgeous fabric and your swap partner will be overcome with joy!!! For a swap I think you should pick a simple quilt you can do and get sent out in time. Add something that is her and something that is you. All I have time for is little quilts...well, that's my justification and instant gratification a anyway! LOL. Quilters enjoy any gift from heart and hands...yours no matter what you decide will be well received. Just use some of your cute fabric and your swap partner will love it. Looks like a darling book! How about a lap quilt in your lovely fabrics? Little quilts are my favorites. From what I have seen of your work, whatever you make will be wonderful. Thanks for the opportunity. Whenever I make something for someone I usually make it mostly for them. But I always add in a little something of me and a little something I haven't tried before... just to make it more :) I know anything you make will be awesome! have fun - and make something you enjoy. swaps are so fun! Who doesn't love getting a swap project?! I would make something that says 'you' because she can make anything she likes but not what you would make! Have fun. Cute little book. I've recently decided to make mostly little quilts! What timing and what a perfect book to help. I'd make something that's you..then she'll think of you every time she sees it. Sew and Quilt from your heart! Everything that you do is precious and I know that I would love to receive something hand made from you. Your recepient will be tickled I'm sure :). Can't wait to see your post with what you've done. I suggest something seasonal. I never tire of pulling out and using my seasonal decorations. And no one appreciates a quilt like a quilter. Looking forward to seeing what you make. Since i'm a PamKitty fan, I would love any miniquilt using that fabric line. Than you for the giveaway. I say something that is more them with your special touch! When I swap I try to make something I think they will love and is more their style. can't wait to see what you decide - I take ages to choose for swaps and then its hard to give them away but its always such fun to make !! I pondered my decision to enter the swap because I do get stressed out about whether the other person will like what I make, but then I figure most everybody in the swap has the same qualms but they keep coming back for more swaps. I'm sure your partner will love whatever you make. I think anything you make would be lovely to receive. Glad you are feeling better. Pull out your favorite line of fabric and the swap will love it because it says Pam Kitty! Ooh, I love and agree totally with what Lamse said. Anything you make with your wonderful fabric would make the receiver ecstatic :) Is it bad form to steal someone else's comment....hmmm, it probably is. And who knows, maybe you'll be using another talented designer's fabric. So, my comment is - I am sure your recipient will love anything from your creative mind and hands! I really do hope I win this book. I would wear it out putting it to good use. Thank you very much for the opportunity! I think you should pick something that will make her think of you each time she sees it. How about a pattern they'd like, in your own fabrics (that they'd like), then it's definitely you AND them. Do something for your swap that you would enjoy receiving. Excited about the book. I think your partner will love anything you make especially if it reminds them of Pam Kitty! I really want this book! I would always want to receive something that reminded me if the maker.I can make something more "me" for myself anytime! I love little quilts. I'd use bright colors. Love the idea of little quilt swaps:) use your quilt fabric lines and I'm sure it will be darling! Advise? Make sure you love what you're making :) When I do that there are extra little touches that your SWITRMO will notice and also love. As makers we love when people show their handmade love. The way I approached my first swap was to look at my partners posts, to get an idea of her taste then just went with my heart. A gift from the heart always feels right to me & who doesn't love a handmade gift. You are amazing! I'm sure whatever you make will be adorable. I have never done a swap before but I would say do something you wouldn't normally do - it seems like a great time to experiment!